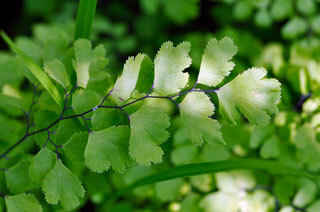 Also Called: Southern maidenhair fern. Culms: Rhizomes short-creeping; scales brown, lanceolate, .08 to .16 inch, shiny. Leaves: Numerous, usually arching or drooping, 5 to 30 inches long; petioles dark brown, 1 to 8 inches, glabrous, occasionally glaucous; blade bright green, lanceolate in outline, 1-2 times pinnately compound, 3 to 18 inches long; pinnae alternate; ultimate segments short-stalked, wedge- or fan-shaped to irregularly rhombic, ca. as long as wide, margins shallowly to deeply lobed, sterile segment margins sharply toothed, fertile segment margins mostly entire, tip variously lobed, rounded to pointed, veins conspicuous; sori linear to oblong or crescent-shaped, on underside of recurved margins on ultimate segments; spores yellow to tan. Habitat: Moist calcareous areas, wet stream banks, rocky ledges, often near springs or seeps. Distribution: Uncommon in Kansas. Specimens found at Konza Prairie Biological Station. Uses: The Navajo applied an infusion of the plant to bumblebee and centipede stings.